is your chance to participate in our largest condominium development to-date. Crescent Shores is located in the Crescent Beach section of North Myrtle Beach, South Carolina. 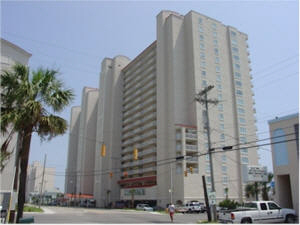 Features include selections never offered before as standard in North Myrtle Beach condominiums. These standard features include granite countertops in the fully appointed kitchens and baths and ceramic tile in the foyer, kitchen and baths. The master bath features a whirlpool tub with granite surround. Large windows and sliding doors border the balconies accessible from the living room and master bedrooms.